» The Kelty Horizon 2 Person Tent Review – Is it a Good Buy? The Kelty Horizon 2 Person Tent Review – Is it a Good Buy? 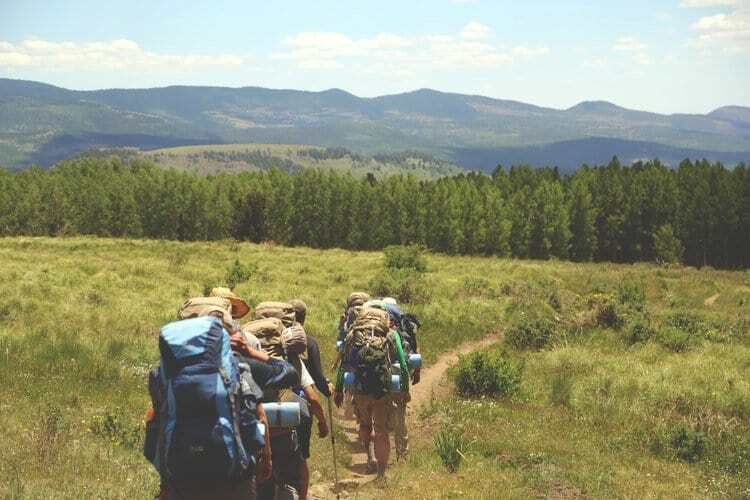 Backpacking is always a better time when experienced with a significant other or a close friend. The only problem is that it is really hard to find a 2 person tent that is both lightweight and easily packed. This is where the Kelty Horizon 2 comes in. Kelty has been making tents that are really easy to pack, set up, and super lightweight since 1952. Including 2 person tents that are backpacker friendly. The Horizon 2 is Kelty’s most lightweight 2 person tent with great features for backpackers. This tent was designed with backpackers in mind. It is one of the most lightweight 2 person tents on the market for its price. You also get a fully mesh roof that allows you to stargaze out where the stars really shine. Easy set up makes this tent a breeze after a long day of hiking. 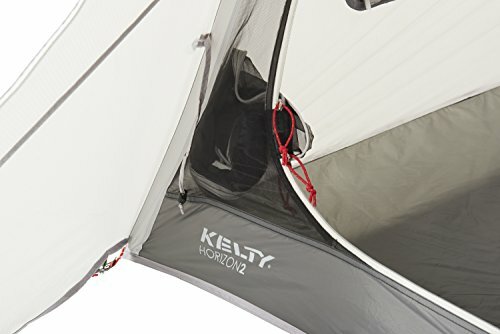 The Kelty Horizon is a 2 person tent. Backpacking with your significant other has never been easier with enough space for two standard sized sleeping pads. Stargaze while cuddled up to your partner inside this cozy tent. Even though this tent was designed for backpackers, it is also a great little car camping tent. There are plenty of comfort features, such as an awning that adds space and indoor mesh storage pockets. It is also nice that this tent will take up little room in your trunk and leave more space for coolers and grills. The rain fly for this tent is built into the construction of the tent body. This feature allows for fewer components that you would usually need for a rain fly. Making it easier to set up and reducing pack weight. Set up for rainy nights is super easy with the attached rain fly. You just unroll the fly and pull it over the top of the tent. Kelty fly attachment is also built into the tent with notches in the pole tabs that the fly ropes simply hook onto. Roll the rain fly back up over the door when done with it. Usually, tents come with multiple poles that almost takes two people to set up. The Horizon comes with an all-in-one pole. The poles are attached at a center point, so when you’re ready to pop up your tent, you don’t have to worry about holding up poles while trying to attach other poles. This tent could be set up and taken down in a matter of minutes. 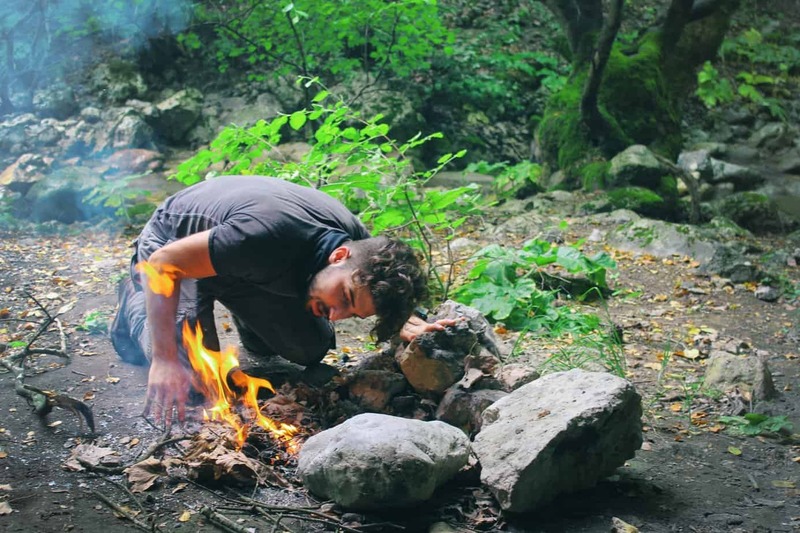 Which is great for when you are tired after a long day of hiking or want to get up early to get started with your hike as soon as possible. 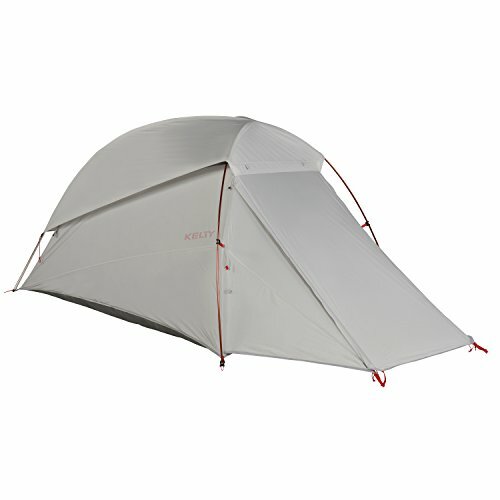 All of Ketly’s tents are very lightweight for their category. The Horizon 2 is one of the most lightweight 2 person tents on the market at its price range. The packed weight is a mere 4 lbs. 5 oz. with a minimum weight of 3 lbs. 10 oz. The weight of your tent is one of the most important factors when finding a tent for backpacking. This tent adds the smallest amount of weight you can get from a 2 person tent. Not only that but if you are hiking with someone else, they don’t need to carry a tent and can carry some things out of your pack. The stargazing fly is a mesh roof that you can see straight through. When you’re far away from the city lights, you can see what the night sky truly looks like. 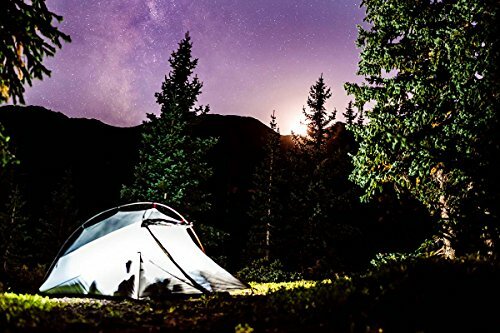 If you’re ready to lay down after a long day, but not quite ready to fall asleep, lay down inside this tent and watch the stars at their brightest. The mesh roof has other benefits as well. This allows maximum airflow on those nights that are a little bit too warm. Since the meshing is on the roof, heat rises up out of the tent. Leave the door open for maximum airflow to push the hot air up and out. The rain fly that extends over the mesh door also functions as an awning. You simply prop it up with trekking poles (not included) into the loops on the bottom pieces and the awning. Steak the tie downs from the awning to the ground for added support. You then have extra coverage outside of your tent. The vestibule adds a ton of space, which could be really useful when two people are sleeping inside. You can leave things like shoes outside under the awning. It is also really nice to put up during light rain if you still want some airflow into your tent. The awning covers the door without closing it off. All of the tent body is made of polyurethane coated nylon. This keeps you dry even if the weather decides to rain on you. The rain fly is raised off of the tent body with the hubbed poles helping with any condensation build up. Although if your fly is not tight, water may get inside. The seams on the tent are all taped to prevent water from leaking in. Usually, the rain fly is the only part of a tent with taped seams, but this whole tent includes taped seams. Including the floors and side walls, ensuring that water cannot leak in from any point. The inside dimensions of this tent are 84 inches long by 52 and 43 inches wide by 43 inches high. This gives you 28 square feet of floor spaces not including the awning vestibule. The vestibule adds another 9 square feet. There is plenty of room to fit 2 standard sized sleeping pads inside and to sit straight up without hitting your head. However,if you are trying to fit two large people inside, it may be a tighter than usual squeeze. This tent is slightly smaller than other other similar tents. The Kelty Horizon features hug clips. After you’ve popped up your all-in-one poles and clipped the peak clip on, you slide the clips onto the pole and twist to clamp on. They are super durable with Clippy arms that “hug” the poles and quick to clip onto the hubbed poles. There are a couple of pockets inside of the tent for you to store things, like a cell phone, headlamp, or glasses. Basically anything you wouldn’t want to roll onto and squish or you just want to keep out of the way. Also, put you turned on headlamp or flashlight inside for hands-free light. One of the mesh pockets can also be used to stow away the mesh door when you want to keep it completely open. Just unzip the door and stuff it into the pocket conveniently located beside the door. The pocket is stretchy, so you don’t have to worry about ripping git while stuffing. This tent fits nicely into the included carry cube with extra room if tightly packed. It’s a square shaped bag that is 15 inches long and 12 inches in diameter. This is vastly different than the usual cylinder shaped bags. The square shaped bag makes it much easier to pack the tent up into it than the cylinder-shaped bags. Even though the tent is easier to pack, the square bag may be a little tougher to get into a backpack. You will have to play around with different ways of packing it. For a backpacker, the number one feature on this tent is how lightweight it is for the price and features that you receive. 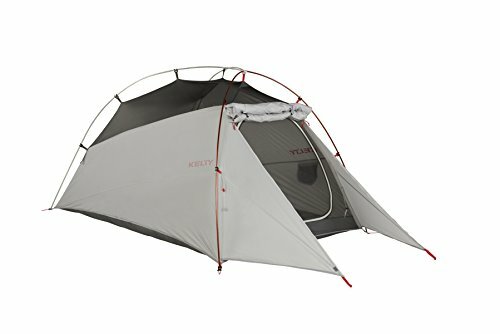 The Kelty Horizon 2 person tent is lighter than other tents that are similar to it and is also cheaper than comparable tents. Making this a backpacker’s perfect tent. Another great feature for not only backpackers but for anyone camping is how fast and easy it is to set up and take down. Everything is basically one giant piece, so you pop up the poles, attach the tent clips, and it is done. No more fumbling around with multiple poles or trying to attach a rain fly perfectly. It only takes me about 3 minutes to set up. One of my personal favorite features is the stargazing fly. I have watched a meteor shower from the comfort of my sleeping bag once and it was one of my favorite experiences. Watching the stars get brighter throughout the night almost makes you never want to fall asleep. Almost all of the fabric on the tent is waterproof with a polyurethane coating and taped seams. Except for the mesh of course, but that is what the attached rain fly is for. I’ve never gotten wet in the light rain, even when water was running under the tent. The rain fly over the mesh roof also does a pretty good job at preventing condensation from occurring by allowing slight air flow. An extra feature that I have never seen on a backpacking tent before is the awning. It’s surprisingly easy to set up with loops to place your trekking poles into and tie downs to keep it sturdy. This really helps keep the inside of your tent cool. It prevents sun and rain from entering while being able to keep your mesh door open for air flow. The awning vestibule also makes it seem like you have more space inside your tent. When you have 2 people camping in this tent you need all the room you can get. Leave the door open to the awning for extra legroom or keep things underneath that you don’t want taking up the sleeping room. The mesh pockets may not seem like much but are really handy. When you have a limited amount of space to sleep on, you don’t want extra things cluttering up your floor space. I wear glasses and I don’t have to worry about rolling over on them in the middle of the night. You can also put a headlamp inside of it and use it as a source of hands-free light. These tents really don’t do well in bad storms. The aluminum frame waivers around in high winds and it seems impossible to get the tie outs tight enough. If it’s windy and raining enough, you will probably get wet. There was one night, during a thunderstorm, I was sleeping almost on top of my significant other to try to get out of the puddle that had formed from my rain fly not being tight enough. Although my partner and I fit fine inside of this tent, that may not be the case for everyone. We are very average sized, if not smaller. If you are over 6 feet tall, there is enough room for your pillow and to sleep spread out, but forget about trying to put any of your gear inside with you. Luckily, there’s an awning you can put things under if it’s not raining. The carry bag leaves plenty of space for your tent and accessories to fit inside without a struggle. However, the shape of this bag is slightly awkward to pack. It’s pretty tall and wide. You could probably slide it in towards the back of you pack. The cylinder bags are simply easier to stuff into a full backpack. I really enjoy this tent. It does its job really well as long as you stay away from thunderstorms. The majority of people will fit comfortably inside this tent alone or with someone else. I love how easy it is to set up and all of the extra features it has to make you more comfortable. It is light enough to backpack for multiple days and fits inside a backpack with a little bit of testing. 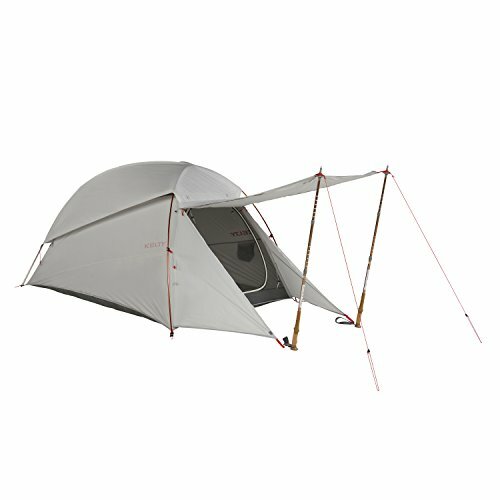 I would definitely recommend this unique tent to other backpackers.